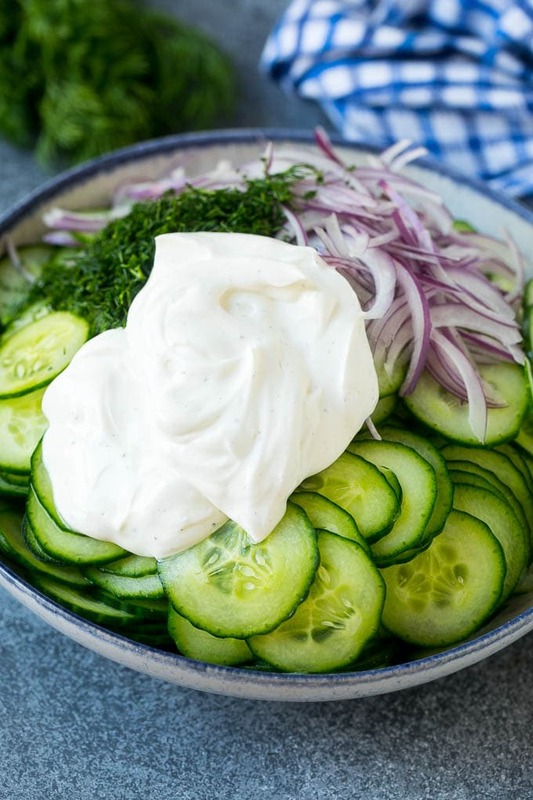 This creamy cucumber salad, also known as German cucumber salad, is a refreshing combination of cucumbers, red onion and dill tossed in a simple dressing. 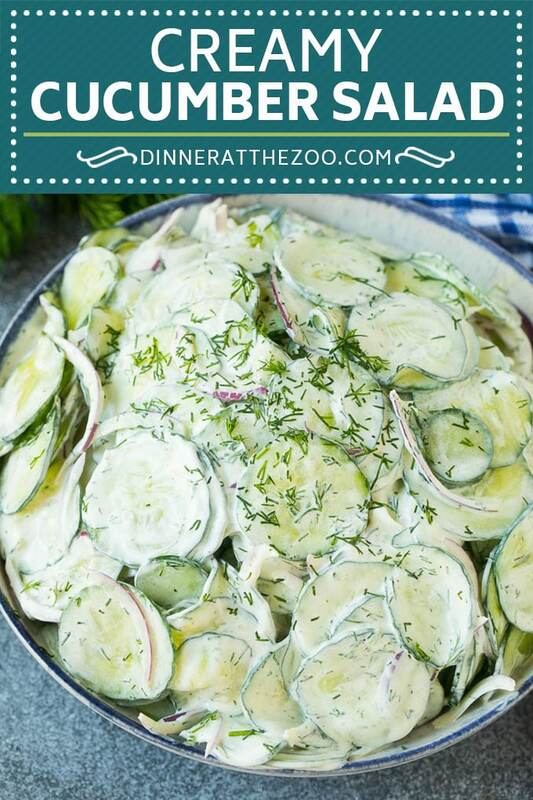 Dill cucumber salad takes just minutes to make and is the perfect side dish for any summer meal. Creamy cucumber salad is a simple yet satisfying dish that pairs perfectly with grilled chicken kabobs, burgers, marinated salmon, and more. It contains just 7 basic ingredients and can be on your table in no time! Most of my favorite summer salads include cucumbers – they’re inexpensive, readily available, and so very versatile. 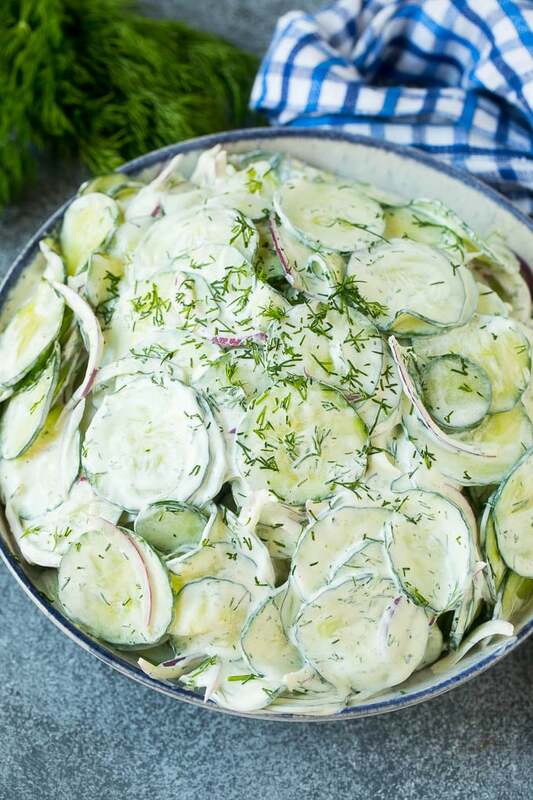 This creamy cucumber salad is always at the top of my list, especially during the summer months because it’s so light and refreshing. Tossed in a light creamy dressing, this chilled salad is the perfect addition to any grilling get together or summer event. Start by slicing some cucumbers and red onion, then mince some fresh dill. Place your veggies in a bowl. In a separate bowl, mix together your refreshing ingredients for the creamy dressing. Pour the dressing over your veggies and toss together to create the perfect German cucumber salad. It’s well worth the money to buy fresh dill. 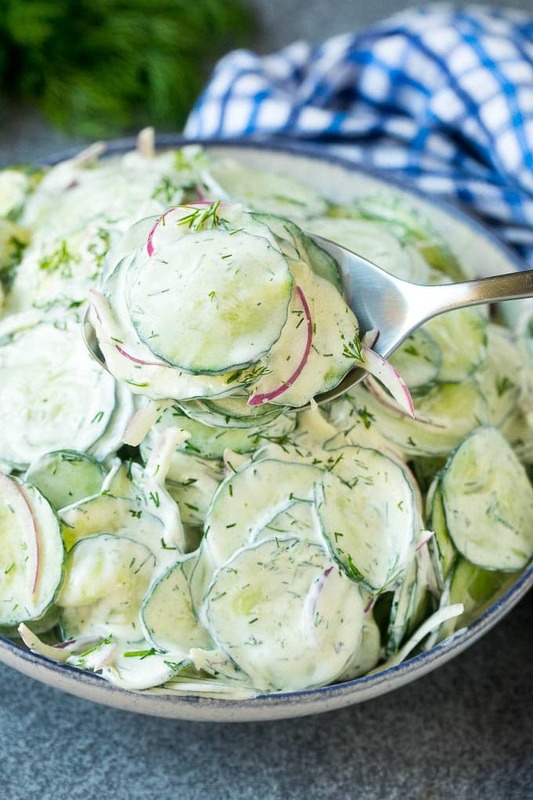 It’s an important flavor component with this dill cucumber salad so it needs to have a strong presence. You just don’t get the same flavor from dried dill. Got leftover dill? It’s great tossed into green salads, sprinkled over eggs, or stirred into cream cheese to spread onto bagels. 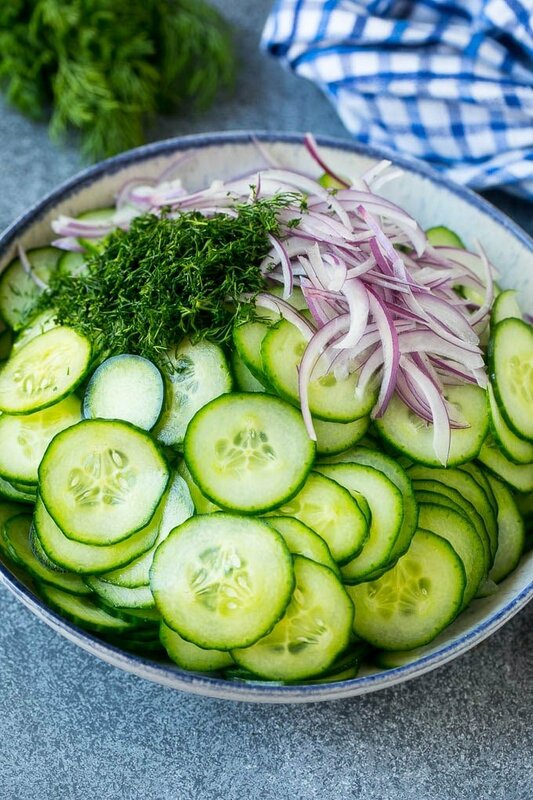 Use a mandoline to get super thin slices of cucumber and red onion. You can use regular waxy cucumbers, English cucumbers, or Persian cucumbers for this recipe. I typically use English cucumbers. If you use waxy cucumbers, you may want to peel them before processing with the recipe. 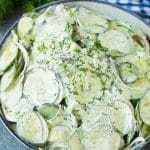 Can cucumber salad be made in advance? This salad can be made an hour or two before you plan to serve it. That being said, I wouldn’t refrigerate it for longer than that. Cucumbers have a habit of releasing liquid as they sit. If the salad is left for too long, it could get watery which dilutes the flavor of the dressing. CAN CREAMY CUCUMBER SALAD BE MADE WITH MAYO? Yes, this creamy cucumber salad and other versions of it, can easily be made with mayo. You will simply need to remove the sour cream from the recipe and use mayo in its place. Be sure to use the same amount of mayo as you would have sour cream. You can even do half and half if you like both ingredients. There are some recipes that are just so easy that you find yourself making them often just because you can. This is one of those recipes for me. It works as a great side dish, snack, addition to sandwiches, and the list goes on. Definitely a keeper in my book! 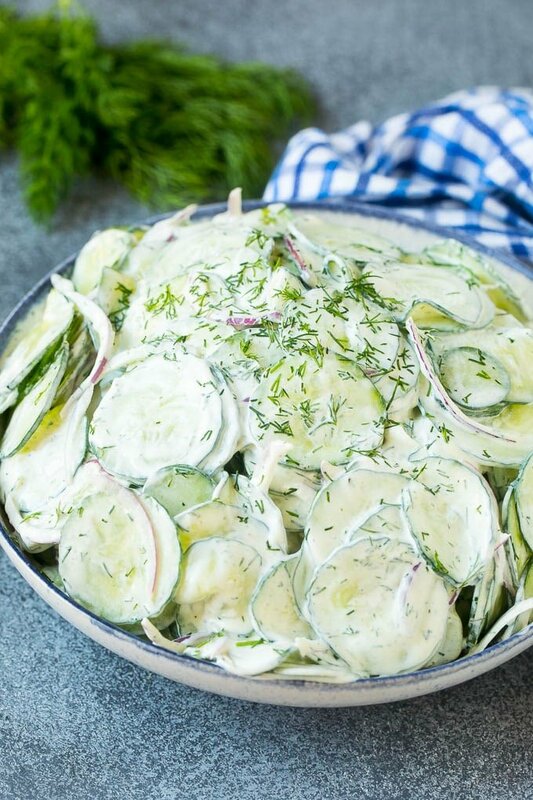 Place the cucumbers, red onion and dill in a large bowl. In small bowl, mix together the salt, pepper, sour cream and sugar. Serve immediately, or chill for up to one hour. Great recipes. I’ve always made with mayo and vinegar, but this sounds even better. I soak my thin sliced cucs in salt water in refrig for a few hours, then drain well. They ‘ll be very crunchy. (got that from my German grandma) Can’t wait to make it. I’ve been looking for good ideas and ways to eat cucumbers. This looks soooo delicious! I just love a cool cucumber salad in the summer! Oooh, I’m drooling as I’m looking at these photos! Bookmarking. Sounds yummy! This looks like a great summer salad. I’m definitely making it for when my vegetarian mother-in-law visits. YUM! My kids are a huge fan of this salad. I’ve made it a few times and they gobble it right up! I will have to make it again sometime. Yours looks yummy! This is very refreshing! I would love to make this when my cucumbers in the garden starts bearing fruits. I Have always wanted to try this kind of salad! 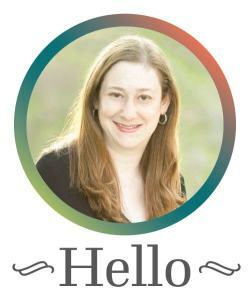 I am going to have to try out your version ASAP! Yum! I love a good cucumber salad. This looks delicious and I know my family would love me even more if I brought this to our next get together! I love cucumber salad. I have made it for years with fresh dill from a dill plant that my father-in-law planted. It reseeds itself every year. This reminds me of a salad my grandmother used to make when I was young. I bet it’s delicious. I’ll have to give it a try. I have to make sure to try this recipe when I harvest my cucumbers. Love that this is a creamy based salad dressing. Hmm, I love cucumbers. This salad looks delicious and so fresh! I love the addition of dill. Such a great recipe for all those summer bbq’s. I’d love this for a side dish over the summer. We grill a lot, and I’m always looking for new side dishes to try. I love cucumbers, so I’ll definitely make this. Oh my goodness, this sounds absolutely delicious! I bet it is such a nice mix of textures and flavours. I love a good cucumber salad! I always find them so refreshing and a good addition to almost any meal! I have never tried a creamy dill one, I usually just do a simple apple cider vinegar and herb salt one. Will definitely be trying this soon! Yummy! What a great summer lunch idea. We are growing cucumbers in our garden this summer, so I will make this once they are ready. We usually do more of a vinegar dressing when we make a cucumber salad. This would be different change up from the usual. I have everything to make this good looking salad.